He worked for STV before joining Sky Sports News as one of the channel's founding reporters. Fraser was one of Sky Sports News' foremost journalists, regularly covering the Republic of Ireland under Mick McCarthy. He broke the news that Roy Keane had been sent home from their training camp in Saipan prior to the 2002 World Cup in Japan and South Korea. Another former colleague, Bryan Swanson, described Fraser as an "inspiration". "Gutted we have lost Fraser Robertson at such a young age," he tweeted. 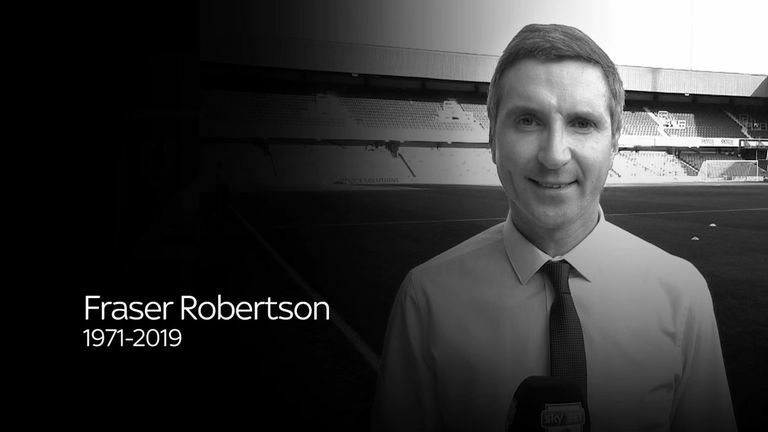 "A journalist with integrity, enthusiasm and who cared passionately about Sky Sports News. "Rest in peace, Fraser, you were an inspiration."